The train ride here is a much longer than your average miniature train ride, covering 2.2km of track and taking approximately 20 minutes. The ride goes from one end of the Esplanade park to the other with 3 stops at the Cafe, the Playground and the Esplanade. Travellers can get off at either end of the journey to enjoy time there before getting on a different train for the return ride. For train enthusiasts there are 4 different engines and 2 different carriages that are used in rotation built to a quarter of the standard NZ railway standard size. The playground near the Fitzherbert Ave entrance, is also recommended. 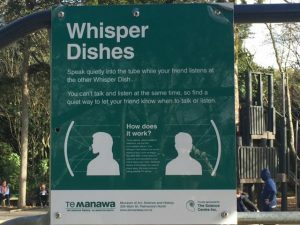 It’s the largest playground in the region so has lots of equipment, with some really different things such as the ‘Whisper Dishes’ that allow you to communicate with someone else at the other dish approx 30m away. There’s a good flying fox, long slides, a Rocktopus, a separate younger kids area (not fenced) and plenty more! There’s free parking just nearby. Victoria Esplanade also has the following features which you might want to check out; a summer padding pool, a cafe (on Palm Drive), aviaries, 2 free BBQs, a tropical conservatory (ask for the ‘find the frogs’ activity) and bush walks. Address: Victoria Esplanade, Park Road, Palmerston North. Street parking is possible along Palm Drive, Victoria Esplanade Drive and the main roads bordering the park. The train operates: Saturday, Sunday, & Public holidays 1 – 4pm. Daily during School Holidays 1 – 4pm and in the summer from Boxing Day to Wellington Anniversary weekend (mid January) 11am – 5pm. Train Price: $3 per person. Under 12 months free.